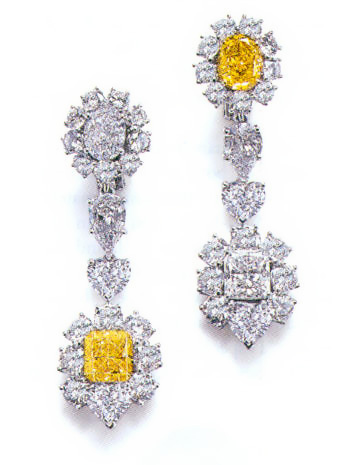 The Nadia Oval Cubic Zirconia Cluster Halo Drop Earrings exude opulence from the influences of the Russian dynasty. 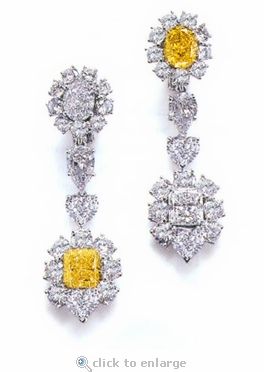 Slightly under two inches long, this stunning combination of canary and white colored cubic zirconia, (as featured) and assorted shapes of cubic zirconia stones further beautify these drop earrings. The Nadia Drop Earrings feature two, 1 carat 8x6mm canary ovals, two 1 carat 6mm canary princess cut squares, two 1.5 carat white pear 9x6mm cuts, two 1.5 carat 7mm white hearts and two 1 carat 6mm white hearts, and over 5 carats of white cubic zirconia rounds, for a total weight over 17 carats for the pair. Our Russian formula diamond quality cubic zirconia are hand cut and hand polished to exact diamond specifications. These stunning drop earrings come with a COMPLIMENTARY pair of our signature large earring backs for additional security and support that eliminates that dreaded earring droop. Available in 14k white or 14k yellow gold as well as various stone color options that include man made ruby red, sapphire blue and emerald green, in addition to simulated pink, canary yellow or diamond look stone color options. For further assistance, please contact us directly at 1-866-942-6663 or visit us via live chat and speak with a live representative.